Throughout her long artistic practice, Louise Nevelson explored the potential of the collage. See the artist’s rarely-shown collages and sculptures in an exhibition featuring some twenty works from the 1950s – 1970s. 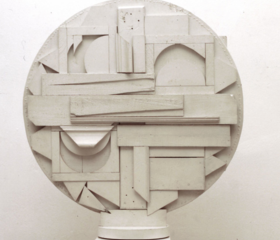 Influenced by cubism and the German-French artist Jean Arp, Louise Nevelson (1899–1988) began early in her career to make sculptures and assemblages out of wood objects she found in the street. By painting them matte black, she combined the separate elements into a totality. For Nevelson, black represented all colours in one, and the harmony she sought in her art. In the 1950s, the sculptures left their plinths and filled entire walls, like large altarpieces. In monochrome black, and later white and gold, Nevelson now created sculpture groups out of lathed chair legs, balusters and scraps of wood, in a scale approaching abstract expressionist paintings. Her monumental works evoke something spiritual and eternal, and express a deeply personal mythology. At the time when Nevelson’s sculptures were taking on more spatial, large-scale dimensions, she was discovering another style in the collage, which enabled her to easily and intuitively explore subjects in smaller formats. Slips of paper, newspaper cuttings and sooty scraps of wood were combined into poetic observations of the overlooked objects, not unlike the German artist Kurt Schwitters’ Merz works. For the exhibition Sixteen Americans at the Museum of Modern Art in New York (1959), Louise Nevelson created Dawn’s Wedding Feast, filling the space from floor to ceiling with white-painted sculptures and two totem figures as the bride and groom, or sun and moon. This expansive work was an allegory on a cosmic marriage with the world, or the artist’s union with her art – a theme she would revisit often. Dawn’s Wedding Feast, which included the sculpture Dawn’s Host (1959), overturned the notion of sculpture as an object to walk around; instead, it was an environment that enveloped the viewer. The work can be seen as a precursor to installation art, but also to the actual liturgical spaces that Nevelson, like the Russian-American artist Mark Rothko, was commissioned to design later on. The exhibition was Nevelson’s public breakthrough, at the age of 60. Louise Nevelson, née Leah Berliawski, was born in 1899 in Perejaslav-Chmelnytskyj, Russia (now Ukraine) in a Jewish Orthodox family that emigrated to the USA in 1905. In the 1960s, she achieved major recognition, and late in life became one of the most celebrated post-war sculptors. In Downtown New York, where she lived from the 1920s until her death, she was a familiar figure, with her heavy, black lashes, known as the grande dame of sculpture.